The Public Utility Commission has asked Sunoco to work with county emergency officials and some school districts to plan evacuation drills in case of a leak in the Mariner East pipelines, a senior PUC official said on Thursday. Paul Metro, Manager of Gas Safety at the PUC’s Bureau of Investigation and Enforcement, told a community meeting in Chester County that there was a “communication gap” between school districts and the emergency planners who are responsible for evacuation plans. Although the PUC isn’t responsible for evacuation plans, it facilitated talks with several state agencies, and agreed to ask Sunoco to set up the plans, Metro told the meeting. “Plans are being worked out for these drills,” he said. The plans were discussed at the latest public meeting between state and federal pipeline safety officials and residents of Philadelphia’s western suburbs who continue to seek information that might help them feel safer about the multibillion-dollar pipeline project that is now carrying natural gas liquids through their communities. About 150 people gathered in a West Chester middle school auditorium on Thursday evening to hear 10 officials from the Public Utility Commission, the Department of Environmental Protection, and the federal Pipeline and Hazardous Materials Safety Administration defend their efforts to ensure the safety of the controversial pipelines. The officials said they were doing everything they can within their jurisdictions to ensure that the pipelines are built and operated safely, but they repeatedly emphasized the limits of their powers. Sunoco, which was not represented at Thursday’s meeting, says that safety is its top priority and that its pipelines meet all state and federal safety requirements. Before the meeting, company spokeswoman Lisa Dillinger dismissed new claims by pipeline opponents that it is risking an explosion by repairing coatings on a pipeline section in Delaware County. “The activities taking place on the 12” pipeline are standard industry practice in the ongoing maintenance of active pipelines and are consistent with federal and state pipeline safety regulations,” she said. 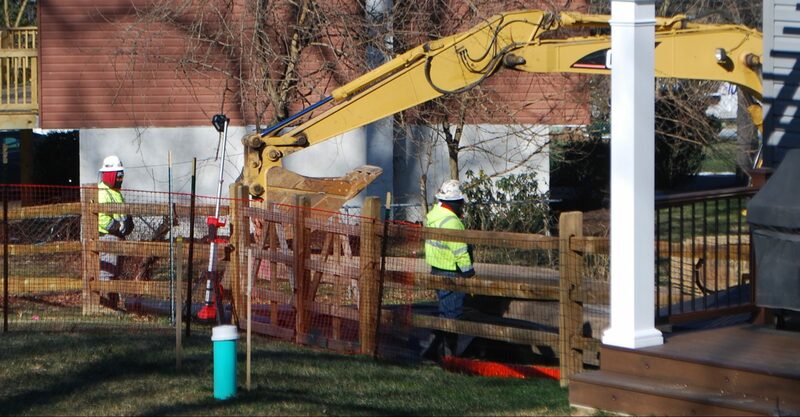 Safety worries spiked in January when a new sinkhole appeared at Lisa Drive, a pipeline construction site in West Whiteland Township where several previous sinkholes opened up about a year ago. The latest incident, like the last, exposed a section of Mariner East 1, a 1930s-era pipeline that has been repurposed to carry natural gas liquids just a few yards from residents’ back doors. Metro said PUC officials are working with a consultant to establish whether the geology at Lisa Drive is sufficiently stable to support several pipelines. He dismissed a resident’s claim at the meeting that the consultant, ARM Group, won’t give an impartial assessment of the geology because of its association with the Marcellus Shale Coalition, a gas industry trade group. Metro said the PUC confirmed ARM’s qualifications when it hired the company to do a geophysical assessment at Lisa Drive after the first sinkholes appeared in early 2018. Metro said Sunoco has alienated many communities along the 17-county pipeline route with its repeated spills of drilling mud and contamination of wetlands and aquifers during construction over the last two years. State Rep. Carolyn Comitta (D-Chester), who arranged the meeting along with State Sen. Tom Killion (R- Chester and Delaware), said agencies such as PUC and DEP are now more willing to use whatever authority they have on pipeline safety than they were two years ago when the Mariner East project started construction. The key to improving safety is to pass laws that would give the state control over matters such as where pipelines may be built, but that’s unlikely to happen anytime soon, she said. Despite a raft of pipeline bills that Comitta and other lawmakers including Killion are introducing or reintroducing in the current session, she doesn’t hold out much hope that any of them will become law because of what she sees as entrenched opposition to more regulation in the Legislature. But she hopes the legislation will prompt more public discussion, and lead regulators like the PUC to take a fresh look at what they can do to ensure pipeline safety. Christie Murray, PHMSA’s Director of Outreach and Engagement, urged residents to contribute to a revised code on public awareness that is being drawn up by the American Petroleum Institute, the industry’s leading trade group that sets standards for operators like Sunoco. “Your voices would be welcomed and I think they need to be heard,” she said.